With each foot you climb, your heart starts to pound faster and faster until you stop rising 140 feet above the ground. You stay there for a second. Once you’re up there, it actually seems a little peaceful. Your heart beat slows back to normal. That is, until the drop. Named after the first proven and “visible” black hole, first discovered in 1971, Cygnus X-1 will show you how to defy gravity. 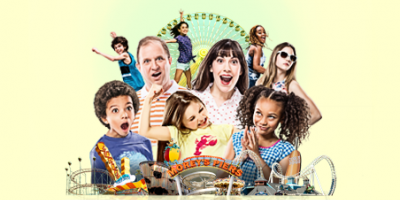 This family thrill ride promises high ""G"" excitement! Sit back and just try to relax as you are wheeled through a gothic haunted castle complete with grisly scenes, ghastly monsters and gruesome sound effects. Haunted decks and menacing underways aboard a really mysterious ship. How am I supposed to get a tan here? The Ghost Ship will open at 5 PM daily during peak season. Operating hours subject to change. The Grand Prix Raceway races it's way through Adventure Pier on a longer and windier wooden track. This go-kart ride is located on Morey's Adventure Pier next to the Great White Roller Coaster. Unleash the newly refurbished Great Nor’Easter roller coaster. The upgraded coaster now boasts a 95-foot drop, a sleek ocean-themed paint job and 2,170 feet of new and improved track that will deliver a smoother and faster ride for adrenaline-seeking guests. The Great White at Morey’s Piers is a classic out and back wooden coaster. The ride begins with an exhilarating 25-foot drop into a dark tunnel. Uhh, we’re gonna need a bigger drop. Yeah? Well you get a bigger drop, one that plummets you 105 feet at speeds faster than 50 MPH. IT is scary as heck with twists you’ll never see coming including massive swings and spins up to 65 feet over Morey’s Piers. From that height, you’ll easily be able to spot every clown on the piers. The high-looping Sea Serpent takes you through not one, but two 120-foot hills and upside down not twice, but three times.